Unlike its evil twin gefilte fish, meatloaf symbolizes that old saw of the sum being greater than the parts. And just like barbecue, making a meatloaf transforms somewhat inferior meat into deliciousness. In barbecue terms, the traditionally lesser cuts like shoulder and brisket, can be converted–by flame, time and love–into something that inspires blogs. Meatloaf morphs the detritus from your fridge into a new entity. Recently, the two intersected, when I fed leftover barbecue into my meatloaf mix. In addition to the traditional ingredients like egg, bread crumbs and onions, I added barbecue from The Q Shack. 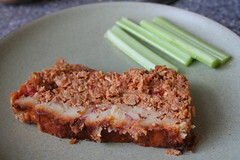 The barbecue meatloaf worked out really well (see for yourself). Topped with some excess Q Shack sauce and bound together with potatoes, this seems like the perfect destination for mediocre barbecue. While Eastern barbecue purists would turn their nose at the use of both tomatoes and tomato-based sauce, it was just that kind of party. Besides, who knew barbecue could double as comfort food?